2. Prepare the cement according to the manufacturer's instructions. 3. Carefully place mixed cement into each retainer or crown in a manner that eliminates the possibility of trapped air. 4. The dentist seats the prosthesis over the prepared tooth or teeth and applies firm finger pressure with a cotton roll to the occlusal or incisal surface to express the excess cement (step B). seating. 6. While the cement is still fluid, the dentist uses a sharp explorer tip to examine the marginal fit and verify the seating of the completed restoration. 7. Place a saliva ejector in the patient's mouth to ensure the area remains dry while the cement sets. 8. Do not attempt to remove excess cement until it has set to the point of being "brittle-hard". 9. When hard, use an instrument such as a periodontal curette, to remove all cement from around the restoration, tooth, and the gingival sulcus area (step C). 10. Gently floss the area, irrigate, and evacuate the area to ensure it is clean. Before dismissing patients with fixed prosthetics, instruct them in procedures for cleaning the restorations. Some of the basic procedures for RPDs are the same as FPDs, but require much more laboratory and appointment sittings. The following is a typical treatment plan you may be involved with if assisting with the fabrication of an RPD. Each bullet represents a secheduled appointment. Prosthetic examination and alginate impressions for study casts. 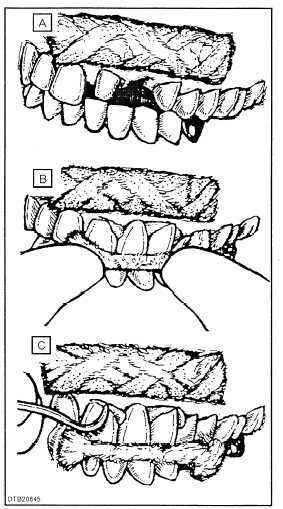 Mouth preparations for RPD framework and final impressions. Final impression of edentulous ridges for fabrication of the acrylic denture base, occlusal registration, and denture tooth selection. Figure 8-45. - Steps in cementing a permanent FPD. Deliver RPD and make initial adjustments as necessary. Follow-up adjustment RPD appointments as required. As with FPDs and RPDs, many of the basic procedures are the same. With increased public awareness on proper oral hygiene, personnel who require complete dentures are becoming a very small population of the armed services. The procedures that you will assist in are interocclusal registration, tooth and tooth shade selection, tooth arrangement, impressions, and CD delivery.